Get excited! JGAP’s annual Hanukkah party is this upcoming Monday night! We’ll be eating latkes, lighting the menorah, and comparing Thanksgivukkah stories from 7:00-9:00pm. The party will be at Rebecca’s apartment near Nassau Street in Princeton. JGAP will be providing latkes, sufganiyot (doughnuts! ), and the fixings. It’s going to be delicious. We would really appreciate if you could bring along an appetizer, salad, side, or drinks so that we don’t run out of food! As always, feel free to bring family, friends and colleagues. PLEASE RSVP to jgap@princeton.edu if you can make it! 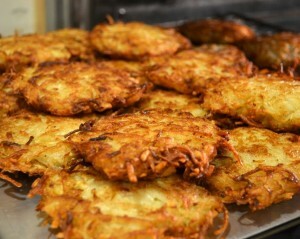 We need to know how many latkes to make, and what you’ll be able to contribute, if anything. See you soon! This entry was posted in Events, Holiday by Shilpa Nadimpalli. Bookmark the permalink.